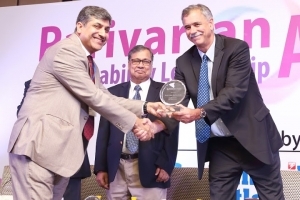 Building on the enthusiastic industry response and success from previous years, the 2015 Award categories were shaped to recognize and appreciate thought leaders of sustainability in the Indian industry. Award Nominations were invited from the companies, organizations, service providers, institutions and individuals who consider sustainability in the process of value creation. 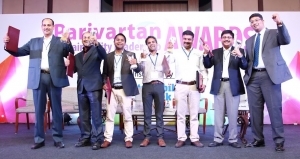 Parivartan Sustainability Leadership Awards 2015 were announced at the evening plenary of Annual Summit of the Sustainable Business Leadership Forum (SBLF) on October 15, 2015. Shri Ajay Shankar is currently the Chairman of the National Expert Appraisal Committee. He has recently served as the Member Secretary, National Manufacturing Competitiveness Council and Former Secretary, Department of Industrial Policy and Promotion. He has rich experience in industrial promotion, the energy sector and urban management and development. He played a critical role in putting together various stimulus packages and took a number of policy decisions to improve the competitiveness of the Indian industrial sector. As Principal Adviser in the Planning Commission he had looked after the water, sanitation and environment and forest sectors. As Joint Secretary/Additional Secretary in the Ministry of Power he played a key role in preparation and enactment of the Electricity Act, 2003, and the rules and policies under the Act and conceived the Rajiv Gandhi Gramin Vidyutikaran Yojana for rural electrification. Shri Ajay Shankar joined the Indian Administrative Service in 1973. He has a Masters in Political Science from Allahabad University and a Masters in Economics from Georgetown University, Washington D.C.
Saurabh Srivastava is one of India’s leading IT entrepreneurs, angel investors and venture capitalists. He founded and chaired IIS Infotech which was ranked amongst the top 20 Indian software companies within 4 years of inception and was listed, post merger, as Xansa on the London stock exchange, with revenues of around US $ 800 mill till it was acquired by Steria. He has since founded/invested in over 50 start up ventures. He serves/has served on various boards, both private and publicly listed companies in the UK and India. He is a cofounder and past Chairman of NASSCOM, the NASSCOM Foundation and the Indian Venture Capital Association. He serves /has served on the National Executive Committees of the two apex industry chambers in India, CII and FICCI He founded and chaired India’s first and extremely successful early stage Venture Capital fund in the private sector, Infinity Ventures and also co-founded the Indian Angel Network, India’s first and largest business angel group with over 180 investor members comprising the who’s who of successful Indian entrepreneurs and CEOs. He is Chairman Emeritus of TIE Delhi. Sachit Jain is Executive Director, Vardhman Group-a Rs.4000 crore enterprise, one of the largest textile houses (Vardhman.com) in India. He has helped shape up Vardhman’s investment in Baddi, Himachal Pradesh, India right from the beginning. Starting with an initial investment of Rs 32 crores he has led the team which put up 9 factories with a cumulative investment of approximately Rs. 1500 crores and a direct employment of over 7000 people. Before joining Vardhman Group in 1990 as Executive Director, he started his management career with Hindustan Lever in 1989. He studied Electrical Engineering at IIT, New Delhi, Management at IIM, Ahmedabad and Financial Management at Stanford, USA. K.C. Mehra, a veteran corporate executive, is the former Chairman of SKF Bearings. He has also served as the Chairman of the National Board of Quality Promotion under the Quality Council of India. KC, as he is popularly known, has held several leadership roles within the Tata Group, including Chairman of Tata Robbins Frazer, Vice Chairman of Forbes Gokak, Joint Managing Director of Tata Steel and has also been the Honorary Consul General of Sweden in Mumbai. George Hamilton has headed the Institute for Sustainable Communities since its creation in 1999 and ISC has developed and carried out 99 projects strengthening communities in 30 countries since then. He has been a member of a variety of boards, commissions, and delegations designed to advance climate solutions, sustainable development, citizen participation, community development and/or environmental protection.From 1989 to 1991, George was planning director for the State of Vermont, and chief policy advisor to Governor Madeleine M. Kunin. He was co-chair of a special commission appointed by New England Governors and Eastern Canadian premiers that organized the first international conference on sustainable development in North America (1989). He also served as chair of Governor’s Development Cabinet. From 1985 to 1989, he was a Policy Analyst in the Vermont Governor’s office, specializing in energy, environment and telecommunications issues. From 1982 to 1985, he was Executive Director of the Vermont Public Interest Research Group — the state’s largest citizen advocacy organization. Prior to that, George was a community organizer and an energy efficiency auditor for a low income weatherization program. Sminu Jindal is the Managing Director of Jindal SAW Limited which is one of the very first companies to be awarded all environmental clearances (ISO 9002,14001,18001) due to her continued commitment to the welfare, safety and security of her employees as well as the custodian of best business practices. She initiated environment protection steps like affluent treatment plants and environment friendly processes much before the government regulatory authorities drive. Ms. Jindal is an alumnus of Shri Ram College of Commerce and pursued her MBA from Fore School of Management, with specialization in Finance. Her outstanding academic performance won her a Silver Medal and she was also given an Award for Excellence as the top woman entrepreneur by Institute of Marketing and Management. OP than conventional double effect chillers on a commercial scale – substantially reducing the operating costs. It makes the direct fired VAMs more commercially viable and allows expansion into comfort cooling markets where low grade heat sources [steam /exhaust] are not easily available. qft office space in Bangalore), the environment has been 100% ASHRAE compliant and 34% energy has been saved (leading to ~ INR 1.5 Lakhs/month savings). The initiative reduced usual AC systems cycling from ~70 cycles per day to ~8 cycles/day improving equipment life and operations – and the savings are equivalent to 22 Tons of less CO2 into the environment every month. Schneider Electric launched a companywide program called Schneider Energy Action (SEA) to drive energy efficiency and energy cost savings in SE facilities through the use of in-house IT based energy monitoring and energy management solutions. The initiative resulted in achieving ~30% (~8 million kWh) reduction in energy consumption at target sites in India, corresponding to CO2 reduction of 8600 tonnes; as compared to the 2011 baseline. This has resulted in avoided energy costs of INR ~50 million INR, with an investment of less than INR 20 million. Mahindra & Mahindra (Nasik) has undertaken ongoing and multiple energy and water efficiency initiatives. Their efforts have led to water use reduction of 61% till March 2015 (saving 301550 cubic meter water); Electrical Energy reduction of 38% (saving 199 lakh KWh and INR 2997 lakhs in revenue); Thermal reduction of 36% over financial year 2008-09 (saving 4684 KL diesel); Green Supply Chain Management for waste reduction, packaging improvement and reduction in CO2 emissions. Smarter Dharma has a cradle-to-cradle solution in construction industry to manage waste generated from natural stone (granite, marble etc) usage. For one of the clients, granite slurry bricks and pavers are created out of 15,000 tonnes of waste, generated on site annually. The product reduces groundwater contamination (resulting from leaching on sites where the granite slurry was dumped) and air contamination (granite powder dumped on open land). International Paper APPM has a innovative Farm Forestry Initiative to employ unutilized and degraded waste land for a gainful purpose where farmer utilizes waste land for growing trees and gets a steady income and mills get its precious raw material-wood, for its paper manufacturing. With success of this initiative, wood consumption from farm forestry of about 250000 MT annually has gone upto 7,00,000 MT annually. Energystar Technologies developed Glowship.com – first of its kind marketplace for energy & environment related products, solutions & services. Glowship partners directly with manufacturers or their authorized sellers and is continuously expanding its reach, selection & offerings to become the marketplace of choice in the energy & environment category. Entrib Technologies has developed ‘ShopWorx’ – a Real Time Monitoring, Digital Production Log, Process optimization software product for Plastics Manufacturers to digitize their shop floor operations, set alarms for critical machine events. ShopWorx has helped its customers reduce the response time for machine breakdown and increase production Efficiency by upto 30%. Simpa Networks has developed an innovative solar leasing business model – “solar-as-a-service” to energy-poor households and micro-enterprises in rural India. Customers make a small down payment to have a high-quality solar home energy system installed, and then pay for energy service by purchasing “energy days” from local agents. The patented prepaid metering technology provides revenue assurance for the company, and for the investors that help underwrite the up-front capital costs of the distributed solar assets. Proklean has fully bio-degradable, non-toxic formulations using a very innovative probiotic fermentation technology. These formulations replace toxic chemical surfactants currently being used by certain industries such as leather processing and textile processing. In the textile sector, these products have resulted in water savings by 10-15%, COD reduction in ETP by 10% and TDS reduction by 15%. 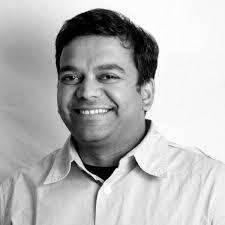 Madhav Pai co-founded EMBARQ India in January, 2008 with a vision to change the paradigm for mobility in cities from moving cars to moving people. Today, EMBARQ India is considered a leader on urban mobility issues in India. Through five cleverly designed initiatives (Scaling BRT, Bus Karo, Rickshaw Rising, Raahgiri and Safe Access to Mass Transit) the 40+ members EMBARQ India team has catalyzed real outcomes nationally, in over 15 cities across the country. In 2014, EMBARQ India’s work has helped catalyse over 346 million passengers trips, 37 million hours saved, 38,200 tons of CO2 reduced, and 414 million USD public investments leveraged to improve sustainable transport.